‘Newfangled’ is the correct word to describe the new homes and businesses that were built at a rapid clip, designed in the modern style with the automobile in mind. Jennings grabbed for the golden ring and gave St. Louis County its first ultra-modern retail village, Northland Shopping Center, located at the intersection of Lucas & Hunt and West Florissant. The town made the bold, jet-age move of ‘one-stop shopping’ by selling a bucolic 64+ acre site next to the train tracks to developers G.J. Nooney & Co. Famous-Barr – then the leading St. Louis department store franchise – took the gamble of committing to a store in an untested suburban marketplace. Would the city people take the bus or drive their cars out to the suburbs? Would the county grow fast enough to support a store this size? The gamble paid off handsomely, and was a key component in the rapid expansion of Jennings and its neighboring towns. For several decades, this was a premier shopping destination and an attraction for persons of all walks of life. Famous-Barr [the shopping center’s anchor department store] gambled on the area’s future and was rewarded handsomely, as the suburban area around it developed rapidly. I have many memories of Northland Shopping Center – or simply “Northland” as we called it. When I was a teenager in the 1970s, Northland was still going strong (it had not yet begun its declne) – and many is the day I’d walk to the shopping center, often with my friend Cindy. Cindy and I might set out for Northland in the late morning. We would have begged and pleaded with our mothers all morning, but finally they would have relented. Our agreement: if Cindy and I walked to the shopping center, my mom would come pick us up later in the afternoon. “Now be ready and be outside Famous at 3:00,” she might say. Of course, we’d be ready, I’d assure her. Didn’t she think we were responsible? It was a long walk to Northland – down Forestwood to Highmont, left on Highmont and then to West Florissant. Then it was West Florissant all the way to Northland. We knew we were getting close when we spied the Schnucks in the distance, but it wasn’t the grocery store we were after. No, we had our sights set on Kresge’s. By the time we got there, it might be just past noon, and we were good and hungry for lunch. Oh, how we loved to get lunch at Kresge’s. We’d find two empty stools at the counter and slide onto the seats. The waitress wouldn’t look any too happy to see us – would we, scrawny 14-year-olds have the money to pay for lunch – and would we even know about leaving money for a tip? Still, she had to wait on us, and we reveled in our time at the counter. As I ‘d eat the deliciously greasy pizza, full of pepperoni, I’d think back to the summer day when my mom had brought me to get my ears pierced. Kresge’s was just great – you could get pepperoni pizza and get your ears pierced, buy 45s and get the best popcorn in the world. After we’d finished our pizza, we’d leave Kresge’s and make our usual rounds – first Worth’s to try on clothes we knew we wouldn’t be able to buy, then Northland Music so I could look at sheet music, and always – always! – we’d end up at Walden Books. I was slowly working my way through the hard-bound classics. At $2 each, they took a fair amount of my allowance, but they looked so nice sitting on my bookshelves – the red-white-and-blue shelves Dad had painted for me. Of course, we’d make a stop at the Famous candy counter – Cindy would get chocolate-covered peanuts and I’d get non-pareils. Then we’d go look at the shoes at Baker’s and, before we knew it, it would be time to meet my mom at the downstairs entrance to Famous. On other visits, with my friends or with my family, I’d go to the bowling alley, the grocery store, the movie theater (I well remember seeing Swiss Family Robinson there). And twice a summer, my dad and I had the wonderful ritual of taking the bus to Busch Stadium, as we used the tickets I’d won for earning straight A’s. The Jennings area was in financial decline by the early 1990s; like the city neighborhoods it replaced, it too was being vacated as residents continued to seek land at the fringes of the metropolitan area, further and further from anywhere. Sales at the Northland center dropped. The single-building Famous-Barr store, surrounded by strip retail rather than an enclosed mall, no longer fit the May Company’s preferred retail model. Maintenance issues began to pile up as well; Famous-Barr vacated the store in 1994. That spelled the beginning of the end for Northland. When Famous pulled out, the rest of the mall struggled to stay afloat – and it was only a matter of time before the wrecking ball hit this beloved shopping center. For insighful commentary about the architectural and cultural significance of Northland, followed by its demise and, ultimately, its demolition, see Weiss’s piece, “Northland Shopping Center: Too Young to Save, Too Old to Matter.” At the end of the piece are links to “A Pictorial Log of the Demolition of Northland Shopping Center,” with these entries: June 15, 2005; June 19-July 4, 2005; July 26, 2005; July 31-September 4, 2005; and September 24-November 9, 2005. A final entry – “Northland Shopping Center Artifacts” – details the many items Weiss salvaged during the demolition. Virtually all of the posts have extensive reader feedback (and memories!) in the comments section. Weiss’s writing about and photographs of Northland are not to be missed! See also “The Rise and Fall of the First Shopping Mall” at YoungSaintLouis.com (St. Louis’s webzine for kids). 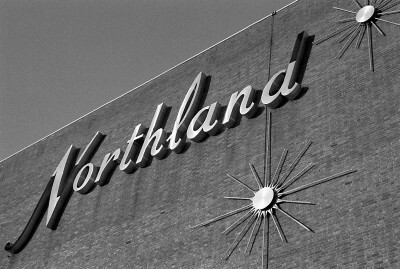 And finally, an out-of-date but nevertheless helpful overview of Northland can be found at DeadMalls.com. One of my big memories is my father taking me and 2 of my friends over to Northland to catch the bus to go to Busch Stadium to see the Beatles in 1966. Also, I remember going to the music store and seeing the Blues Magoos in person on a Friday night. Many pairs of shoes and pieces of clothing were bought as well as hot pretzels at Famous-Barr and paper dolls from Kreskies (sp?). If you’re on Facebook . . . The author of the award-winning memoir "Power in the Blood," Dr. Linda Tate is currently conducting research for a new book, "Ferguson Girl: A Story of Family, Place, and Race." Her extensive research on the history of nearby Wellston, another of St. Louis's inner-ring suburbs, will be included in "Ferguson Girl." Linda's family lived in Wellston for over 60 years.